Here at wilko we have an amazing team of product designers who love nothing more than taking a problem and finding a smart new way to fix it. When you look at our product range, you’ll find loads of simple, thoughtfully-designed solutions that are great value and look good, too. When our pet product designer Abby first started thinking about a new range of wild bird feeders, she wanted to really get to the heart of the problem. In fact, the idea for the new wild bird range was born out of the frustrations of trying to use more conventional feeders in her own garden, and she was sure that other people must be having the same problems. Our bird feeding range began a year ago with our Seed & Niger Feeder and Peanut & Suet Pellet Feeder. These products were designed to come apart completely for really easy cleaning. We also added in loads of other great features including a built in seed catch tray with drainage holes and aeration holes in the base to cut down on condensation and mould. The lids pop off simply and completely which, together with the funnel-shaped tops, make them really easy to fill, even for people who don’t have lots of mobility in their hands. We also wanted them to be great for birds, so the niger slots are perfect for tiny beaks, the bases include an incorporated perch, and best of all, the hang-anywhere removable strap means feeders can be put further up branches where birds feel more protected when they’re feeding. Building on the success of these two feeders, we’re really excited to introduce our two newest wild bird products. We incorporated a lot of the same design features into our new Fat Ball Feeder. Fat balls are a great source of nutrition and birds absolutely love them. They can get a bit messy though, so it’s really handy to buy a feeder which is easy to clean. Our feeder’s been designed with this in mind, and the sturdy plastic can be soaked and scrubbed without any danger of rusting. We kept the simple pop-off lid and funnel-shaped top as they worked so well on the previous feeders. We also made it bigger than a standard size feeder – it holds up to six regular sized fat balls so you don’t have to fill it as often. Sorted. Summer tip: Keep your bird bath topped up if you have one. Natural water sources can dry up at this time of year, and a quick dip in cool, fresh water really helps birds cool down on a hot day. The wood and green plastic design of the Wild Bird Feeding Station has a modern but natural look, and although you can stain or paint it if you like, the wood is pre-treated, so you can just pop it straight up with no fuss. It’s designed to fit together easily, quickly and without tools, although it’s a good idea to use a screwdriver or something similar to help screw the base into the ground. Holding up to three feeders at once, you’ll have loads of different varieties of birds flocking to your garden in no time. The screw base was an idea borrowed from rotary airers. Instead of a more traditional spike in the ground, the screw-in base offers more stability, and it’s really easy to move about if you need to. Summer tip: You might think of feeding the birds as something you only need to do in the winter, but they could use our help in the summer months, too. At this time of year, birds will be raising their young, plus spells of hot and dry weather can dry up food sources, so they’ll be really grateful for any extra bits you put out for them. 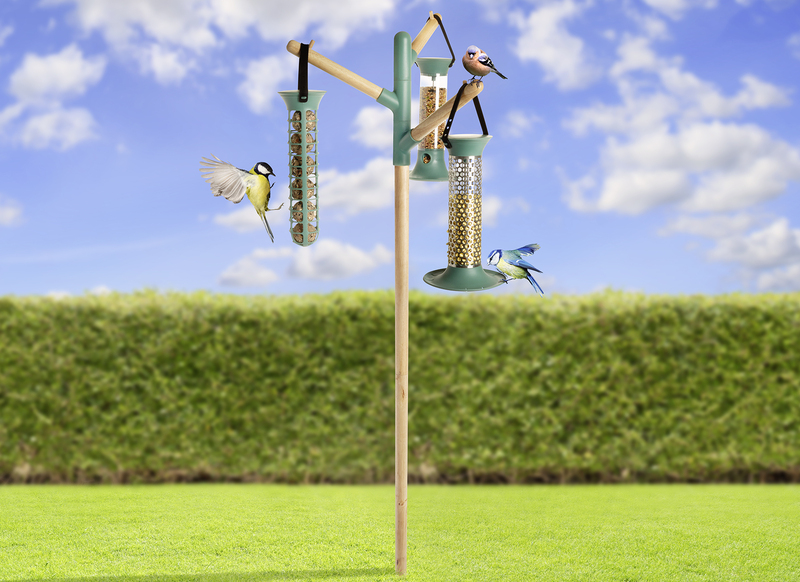 Pick up all three bird feeders and the feeding station either in store or in our wild bird section at wilko.com.